and Drama events helping to serve refreshments at school productions. These are very special occasions highlighting some amazing talents and we are really pleased to offer our help. We also join with our friends in the Old Hymerians and have provided the bar staff at the Old Hymerians’ Dinner. The HCA run the sweets stall at the junior school disco, but bring some change folks, as £20 for 20p worth of sweets can be a bit tricky. This year we purchased new trophies and a trophy cabinet for the Junior School. If you were lucky enough to be a trophy winner, well done and keep it shiny! We also made a large contribution to fund PA equipment for concerts and outdoor events. We hope these will be well-used and will help to enhance the experience of Hymers’ outside events. 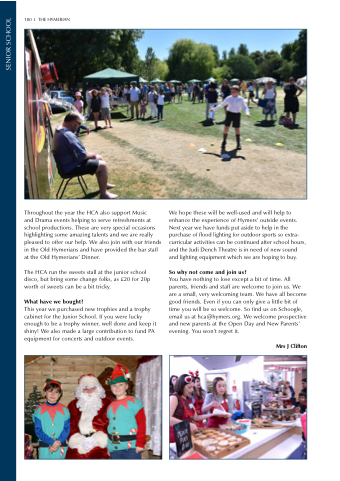 Next year we have funds put aside to help in the purchase of flood lighting for outdoor sports so extra- curricular activities can be continued after school hours, and the Judi Dench Theatre is in need of new sound and lighting equipment which we are hoping to buy. You have nothing to lose except a bit of time. All parents, friends and staff are welcome to join us. We are a small, very welcoming team. We have all become good friends. Even if you can only give a little bit of time you will be so welcome. So find us on Schoogle, email us at hca@hymers.org. We welcome prospective and new parents at the Open Day and New Parents’ evening. You won’t regret it.